Bernard “Pretty” Purdie (left) and Rob Paprozzi (middle) raise the heart at a recent workshop at Local 802, featuring students from the York College Big Band under the direction of Tom Zlabinger. All photos by Steve Singer. Music education is more than giving weekly lessons, teaching a theory class, or working with a high school band. It is about instilling passion, excitement, and wonder at the many genres and styles of music, and then nurturing the student’s ability to share that experience with others. The greatest thrill for a teacher is when a student gets it – when the light bulb gets switched on. Suddenly, the possibilities are endless. Recently, Local 802 had the opportunity to light up the musical lives of some very lucky students and audience members. 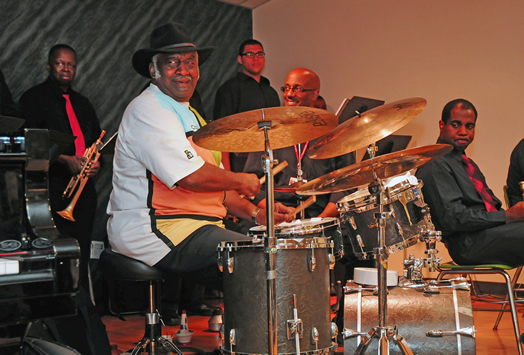 In late October, we hosted “Finding the Groove,” an evening with legendary drummer and groovemaster Bernard “Pretty” Purdie, along with Rob Paparozzi, the world-class harmonica player and front man. They came here to conduct a jazz clinic featuring the York College Big Band. The evening was free to members of Local 802 as well as students. Tom Zlabinger also serves on the union’s Jazz Advisory Committee. The gig was presented by Music for a Sound Future (which I direct), and the Council for Living Music. 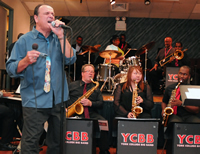 The York College Big Band is directed by Local 802 member Tom Zlabinger, who also serves on the Jazz Advisory Committee. Mr. Zlabinger is assistant professor of performing and fine arts at York, where he has cultivated a thriving music program. After a brief welcome to this historic event, jazz rep Todd Weeks spoke about Local 802’s Justice for Jazz Artists campaign. Todd’s report prompted several in the audience to immediately sign the jazz campaign’s petition as well as ask for more information about the campaign itself. 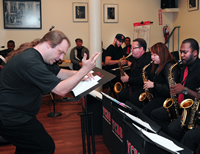 The clinic became more than a music education event; it was also a powerful organizing tool. With the introductions finished, the York band played a couple of tunes, followed by a few choice comments and suggestions from our esteemed clinicians, mostly about feel and overall style. Then the real teaching began as Mr. Purdie commandeered the drums. He blithely informed the band and audience “Now, I’m going to mess them up” as he joined the students in a rendition of “Soul Bossa Nova” by Quincy Jones. Before they started, Mr. Purdie explained “I’m going to change things up a little from the way you’re used to it” – and off they went. Mr. Zlabinger counted off the tune and Mr. Purdie did that thing that he does so well: he immediately found the groove and fell right into the rhythmic pocket of the bossa. The young band members were clearly not prepared for their new drummer. You could hear them struggling to find the groove. Yet, slowly but surely, phrase by phrase, they began to loosen up until finally they got it – that illusive yet tangible groove that makes a tune flow. The change was staggering. Everyone present heard and saw the difference. With Mr. Purdie at the helm, the band sounded tighter, yet more relaxed. They moved differently. But most importantly, you could see the realization in the students’ eyes. The lights went on. They got it. 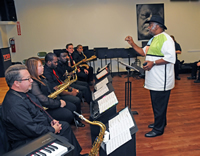 Bernard Purdie gives some tips to the York College Big Band. Then the students turned their attention to Mr. Paparozzi as he began speaking about the role of the front man/singer. He talked about flexibility and how to adapt to each different singer one works with. He said that ultimately it’s about interaction. Both teachers emphasized that growth only comes from working live with other musicians. One must learn to listen and step back to make space for the groove. Mr. Purdie repeatedly used the phrase “less is more.” Mr. Paparozzi’s mantra through the evening was “never stop listening.” Wise words for the young band members who often think that the more notes and faster you play, the better. After another number from the York band, the clinicians invited a few audience members up to jam, teaching by example. But what shined through above everything was the pure joy of the music making. Everyone was grooving and the music just flowed over with exuberance and elation. Event organizer Bettina Covo flanked by Bernard “Pretty” Purdie and Rob Paparozzi. The evening ended with a Q&A session. The inquisitive audience wanted to know about Mr. Purdie’s past experience with such greats as James Brown and Aretha Franklin. Everyone was treated to a few entertaining yet insightful stories about the inner workings of the music business. Mr. Purdie recounted an incident with James Brown when the Godfather of Soul levied a $25 fine on Mr. Purdie (one-fifth of his weekly salary at the time) for a mistake during a performance – a mistake that Mr. Purdie said he didn’t make! After confronting an implacable Mr. Brown, Mr. Purdie gave his two weeks’ notice. He explained, “Sometimes you just have to walk away. It’s about respect.” Here was an invaluable life lesson imparted to these young musicians. The impact of these invaluable insights and critiques given by these two great professionals was apparent. The students had a blast, and it was truly a great event. The atmosphere was relaxed. Pro-union sentiments were high. Conversation and camaraderie abounded. The excitement was palpable and all in attendance sensed what a very special evening this was. Almost every audience member came up afterward to express their gratitude to me and to Local 802 for presenting such a wonderful evening. The resounding comment: When is the next one? This landmark, free event allowed Local 802 to connect with students and musicians in an extremely positive way that was both edifying and entertaining. It brought together students, professional and amateur musicians, union members and non-members as well as international musicians all under the same roof for a common purpose – to learn. The lights were turned on, shedding a warm glow on everyone who was there that night.